Back in early 2013, I was working on an RDBMS project with Java. The project goals required that we stand back and look at our data in a different way to the traditional rows-and-columns approach. The real challenge came with the persistence layer. Not only capturing and persisting the data but persisting the connectedness of the data. What I mean by connectedness, is the meaning behind what the relationships are between various bits of data. We soon discovered that the RDBMS approach required some real creative thinking and compromises; even then, it still didn’t deliver on the connectedness. Thank you Neo4j for coming into my development life during this time! After doing some initial tests, we discovered the headaches caused by using an RDBMS just melted away. There’s nothing wrong with RDBMS, the perspective of the data we needed just didn’t fit that model. Neo4j treats data relationships between as first-class entities. This gave us the connectedness we tried so hard to achieve but without success using a RDBMS. To me then and still now, this is the sweet spot of application development. This is where the real value can be found and brought forward into your applications, regardless of their type: web app, mobile, desktop, etc. As the old adage says ‘Data is King!’, but we should change that to, ‘Data Connectedness is King!’. You only need to look at massive web sites like Google, Facebook, eBay, Yelp and many others, to see who has had the realisation that ‘Data Connectedness is the King!’. It’s only now in recent times that technology enabling connectedness is available to us all. Neo4j is an excellent equaliser, giving everyone the opportunity to see and analyse their data in completely new, refreshing and connected ways. You can almost hear the ‘Aha!’ moments when developers and business analysts see their data from this new perspective for the first time, giving them the realisation that the real value of their data has been hidden all along. I get a real buzz from people getting this new exciting perspective on their data. This surely is what technology is all about, helping us see the ‘wood for the trees’. From my own personal experience, working with Neo4j has helped me reconnect with the feelings of building something tangible, worthwhile and something that will make a positive difference. I knew I needed to share this passion with other developers, regardless of development background, so I put together a two-part online course in a hope to go some way in helping others discover ‘Connectedness’ in whatever they want to do in the world of programming. 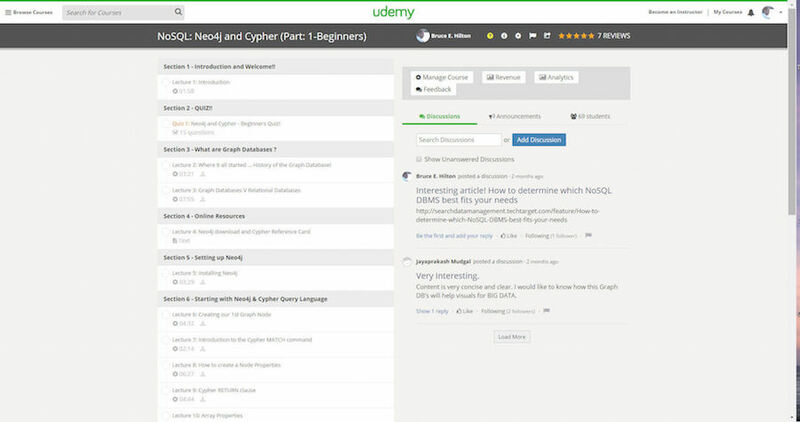 I’d like to introduce you to my online self-paced course hosted on Udemy: ‘NoSQL: Neo4j and Cypher’. We look at the rich heritage of graph theory by taking a peek at the point of origin and history. 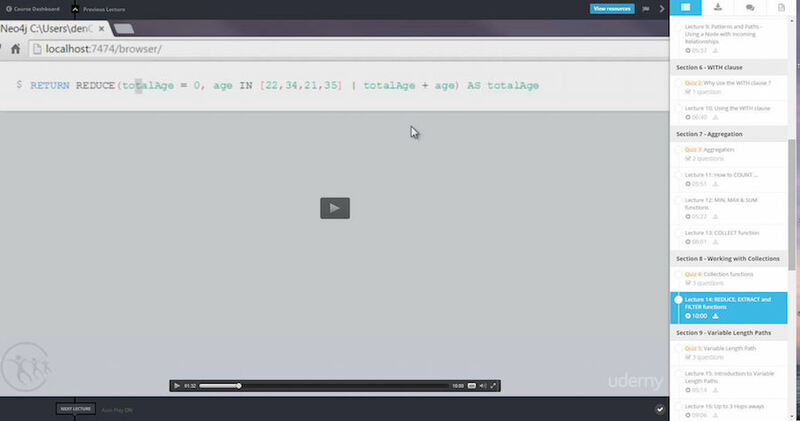 Then we take a look at the differences between Neo4j and relational databases and discover the ‘connectedness’ advantages Neo4j brings. Part 2 is a more intermediate level course building on what was learned and discovered in the first part of the course. Again it’s a practical, hands-on approach, more to do with working with connected data, getting attuned with the graph database way of thinking. This is done by building your skills on searching using patterns, how to traverse the database using Cypher, working with collections, textual searching, variable length paths and determining the shortest paths, conditional expressions and even pagination, all using the Cypher language. 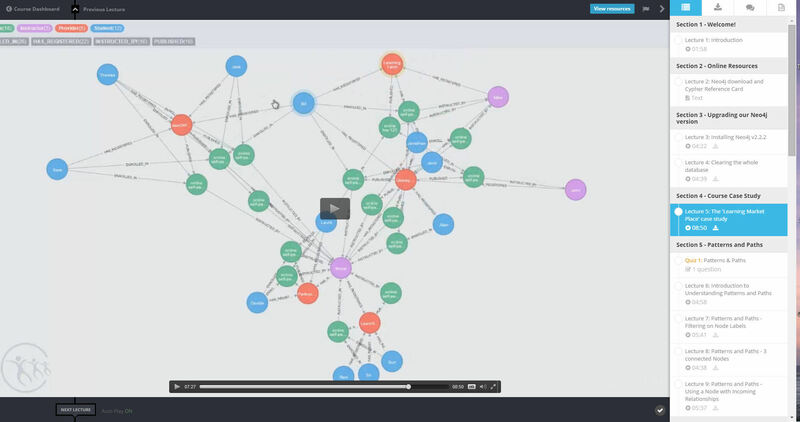 You will finish the course with a strong understanding for the connectedness Neo4j brings. And, of course, lots of graphing. 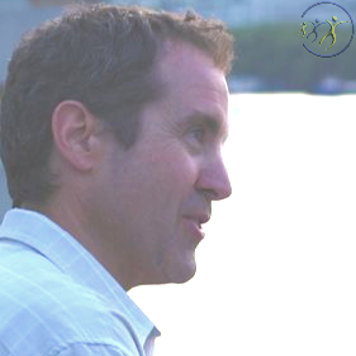 Sign up for the courses here, or follow Bruce on Twitter for more.